The proposed North Harricana river aquatic reserve is located in the Nord-du-Québec region, between 50°11’ and 51°00’ latitude north and 79°07’ and 79°20’ longitude west. 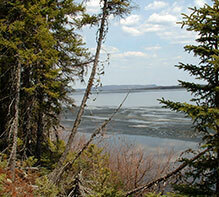 It is situated to the south of James Bay, roughly 110 km north-north-west of ville de Matagami. It lies within the territory of municipalité de Baie-James.